I will be using this review for the “The Book Was Better?” square in CBR10 Book Bingo. I admit it: I watched the Netflix movie before I read the book. I have a weakness for teen rom-com cheesy goodness, the waiting lists at the library were massive, and I really wanted to know what all the Buzzfeed stories were about. Of course, I absolutely loved the movie. Lara Jean was adorable, Peter Kavinsky was adorable, they got up to adorable shenanigans and developed an adorable romance. I almost didn’t want to read the book, but I figured it would be a good chance to compare and contrast, and also fill out another square in my Cannonball Bingo card. To All the Boys I’ve Loved Before is about Lara Jean Song Covey, who is the middle sister, a dreamer, and a romantic. Her older sister Margot has stepped into a mother role since their mom died years ago. She takes care of everyone and keeps everything running. Margot is about to go to school in Scotland, so Lara Jean will have to step up to take care of their father and the youngest sister, Kitty. Kitty is sassy, fights with Lara Jean a lot, and obsessed with getting a dog. Lara Jean has a habit of writing letters to the boys she has crushes on. She has a hatbox with five letters in it, none of which are meant to be read. Then someone sends the letters. 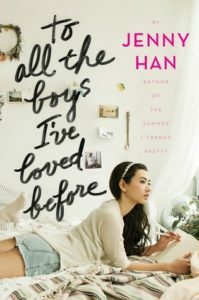 Lara Jean only finds out when she is confronted by Peter Kavinsky, one of the coolest boys at school, who was just broken up with by Lara Jean’s former friend Gen. She had a crush on him back in middle school, and he was her first kiss. Peter and Lara Jean agree to pretend they are dating. Peter wants to make Gen jealous and get her back. Lara Jean is using Peter to show that she is over her crush on another letter recipient: Josh. Josh is the boy next door, and also Margot’s boyfriend, recently ex-boyfriend. So, yeah, it’s one of those complicated faking it things where the lines become blurred and then emotions become real, etc. I preferred the movie over the book version. The characters were more likeable, especially Kitty and Peter. Peter especially seemed kind of not great in the books, whereas he was a lovable little muffin in the movie. It was nice to have a book and movie starring a half-Korean heroine. It was sweet how their father tried to cook Korean food to celebrate his daughters’ heritage (Even though he wasn’t great at it). I’m probably going to have to buy P.S. I Still Love You because those waiting lists are still a bit much for me, but I am interested in seeing what comes next in the series before the next movie comes out. You can visit my review in its natural habitat on my blog here.